Form No. 4.-100. 17.8.10. Delivery Date 15 APR 1912. No. OLYMPIC, Handed in at CARPATHIA. To : OLYMPIC Received 2.10 pm N.Y.T. 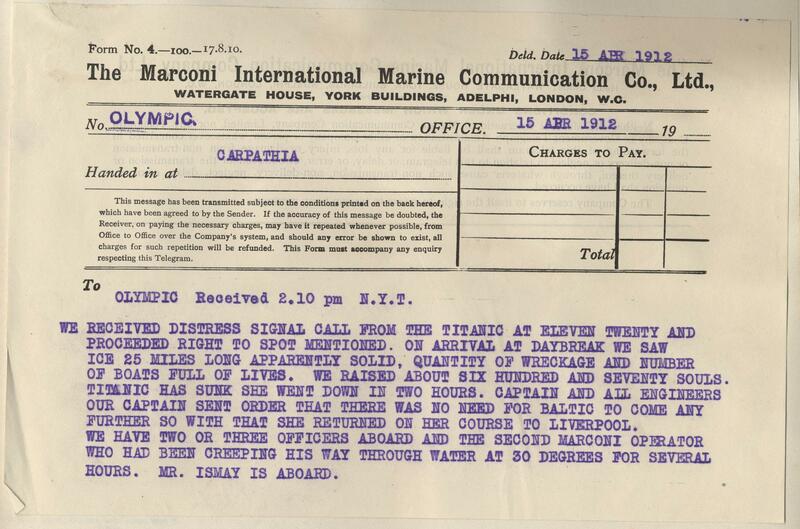 WE RECEIVED DISTRESS SIGNAL CALL FROM THE TITANIC AT ELEVEN TWENTY AND PROCEEDED RIGHT TO SPOT MENTIONED. ON ARRIVAL AT DAYBREAK WE SAW ICE 25 MILES LONG APPARENTLY SOLID, QUANTITY OF WRECKAGE AND NUMBER OF BOATS FULL OF LIVES. WE RAISED ABOUT SIX HUNDRED AND SEVENTY SOULS. TITANIC HAS SUNK SHE WENT DOWN IN TWO HOURS. CAPTAIN AND ALL ENGINEERS OUR CAPTAIN SENT ORDER THAT THERE WAS NO NEED FOR BALTIC TO COME ANY FURTHER SO WITH THAT SHE RETURNED ON HER COURSE TO LIVERPOOL. WE HAVE TWO OR THREE OFFICERS ABOARD AND THE SECOND MARCONI OPERATOR WHO HAD BEEN CREEPING HIS WAY THROUGH WATER AT 30 DEGREES FOR SEVERAL HOURS. MR. ISMAY IS ABOARD.